Public Access Kiosks in Aberdeen by an organisation called 'Public Dataweb'. These units are outdoor and have an umbrella above them. 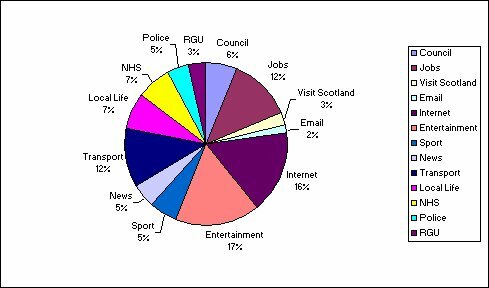 Statistics on usage by the people are also pretty interesting as Entertainment and Sports dominates the usage with things like Email barely being used. The units also provide wireless WiFi download to mobiles. First introduced in April 2006 in the city centre streets of Aberdeen Scotland. The 'i' Kiosks have dual operational viewing screens. Provide all the Public DataWeb multiple content service's. A Verbot / Avatar assists and can also read out messages. 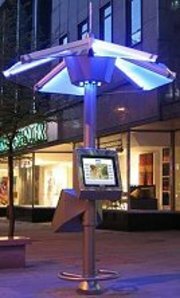 One major factor in collecting usage statistics over many years shows that when we introduced the Umbrella kiosk design usage shot up! With far less kiosks the usage on our new street kiosks rapidly exceeded the other designs. We believe this is due entirely to the open access design. Public DataWeb usage statistics are collated and analyzed regularly. The chart shows a typical month from a small random selection of kiosks. The hit rates are very reasonable and are typical of the usage on the service over the past 3 years. The previous 18 months were much more erratic. This shows that access has settled down and a pattern of use has emerged, with reasonable access to council services and other citizen government facing options keeping pace with obvious top selections like entertainment, news and sport. 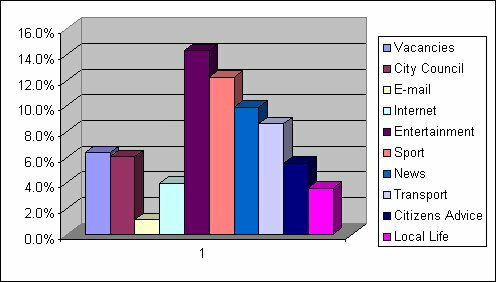 The statistics break down: usage by context/categories. Importantly the usage hits are further automatically analyzed by our unique statistics profiler that generates the variable of hits that are associated with finding the exact need of the user. It is important to know the need itself is being satisfied e.g. for example, typically for job vacancies a person searches first by location or job category then a list of available vacancies, the links selected before reaching the target and actually finding jobs are in a percentage amount of the total links. People want the jobs not the links and probably other systems count these links as hits, they are not. The statistics show users are consistently reaching over 70% of their target need; thus the system is engaging them and providing rapid demonstrable access to their requirements. Time in use: average time spent each session is 4.5 minutes. Average time taken traversing links to exact need i.e. a job category is 5 seconds. Notes; Percentage profiling also proves that genuine users are in the main as over 70% reach their choice whereas children or browsers will be mainly collected within the links rather than the results. Weather plays a role in usage winter months and holiday periods reduce access. In the evening the top shelter structure becomes illuminated. The design maximises the visibility and the functionality. It has increased usage dramatically.